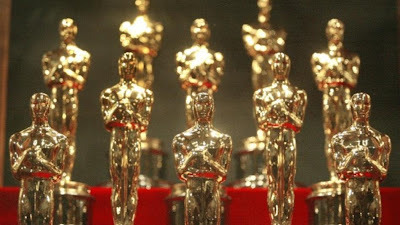 Cinemaphile: Oscars 2003: Nominee Predictions, or "How We Will Honor Crap and Ignore Greatness"
Oscars 2003: Nominee Predictions, or "How We Will Honor Crap and Ignore Greatness"
The headaches are coming, people. Just imagine it: months and months of speculation, discussion, argument and excitement over the year's finest achievements in filmmaking are all about to be flushed down the toilet as we inch ever so closer to Sunday, March 23, the day when Hollywood stands still, brilliance is left without reward, and highly-promoted underachievers walk up to podiums to accept awards that have about as much lasting impression on viewers as a Rob Schneider flick. And if that isn't enough to suggest oncoming migraines, just imagine this: award winners opening up folded sheets of paper to dish out some long-winded and sappy acceptance speeches, only to have their words sidelined by a gung-ho orchestra trying hard to keep the ceremony under a four-hour running time when they know darn well it is nearly an impossible feat. Yes, the headaches are indeed coming. It would be easy this year for all of us if we forgot that the Academy Awards are going to happen this year. In fact, it might even save us a lot of aspirin if we were to forget that they even existed in the first place. Why so much hostility on my part towards a ceremony that I so religiously cover on an annual basis, though? Allow me to offer my reasoning via three simple words: "A Beautiful Mind." Face reality: when we last ventured into the world of the "elite" movie voters, stakes were higher than they had been in years. The two best films of 2001—"The Lord of the Rings: The Fellowship of the Ring" and "Gosford Park"—were among the Best Picture nominees. The latter was an obscure sneaker, but the former was a very successful choice that embodied the groundbreaking and flawless sense of craftsmanship we expect to be honored at a ceremony as prestigious as this (and the 13 awards it was nominated for greatly foreshadowed that notion). But when it all came down to specific honors, what did the ever-so-bewildering Academy do? Why, they went with tradition of course! By bestowing their top honors onto the weakest of the five major nominees, a decent but flawed and schmaltzy biopic that deteriorated greatly after repeat viewings, thousands of members of a film society slapped the very face of modern film art itself. It remains in the mind as a painful reminder to just how silly and irrelevant all awards shows are in the grand scheme of things. A year later, little change is foreseen as we gallop towards the first phase of the Oscar hoopla, with apparent masterworks generally being ignored while somewhat less material is given the big studio push. It doesn't help matters, furthermore, that Miramax—the most infamous of the big movie studios around awards season—is thrusting a very undeserving film like "Chicago" for major awards consideration, either. And since it has already acquired the all-important Broadcast Critics and Golden Globe awards—not to mention five nods at the Screen Actor's Guild—whose to say that it simply won't walk off with the top prize in March? The Lowdown: This year's best of the possible award contenders—"The Two Towers"—will be more of a dark horse nominee this year than "The Fellowship of the Ring," the first film in the "Rings" trilogy, was last year. Why? Three strikes against it this time: 1) it is a fantasy film; 2) it is a middle chapter; and 3) it hasn't one very many press or industry awards (although the Online Film Critics Society, a union of Internet critics which I am proud to be a member of, rightfully gave it top honors earlier in January). The nomination itself will be its only significant reward, because the Academy will be more concentrated on the Miramax products—"Chicago" and "Gangs of New York"—and "The Hours," which have all been front-runners since last December anyway. When it comes to the fifth selection, it's anyone's guess right now, but my money is on "My Big Fat Greek Wedding" because of its unforgettable success (both critically and commercially). Plus, it also got a Producer's Guild nod last month, which doesn't hurt maters when it comes to an award on this level of popularity. Possible sneakers: "Road to Perdition," "Far From Heaven," "The Pianist" and "Adaptation" (the latter two of which would more than deserve the recognition). The Lowdown: In order to fulfill the annual pattern of one of the five Best Picture nominees not being recognized in the directing category, the Academy will forget about Joel Zwick, the man behind "My Big Fat Greek Wedding." In his place will be Todd Haynes, who made the critic darling "Far From Heaven." Potential other appearances could come from Steven Spielberg or Alexander Payne, but it's not as likely; Spielberg's drawback is that he had two big movies out in 2002, while Payne's is that "About Schmidt" lost significant amounts of steam after its mid-December opening. To be sure, Roman Polanski could be a dark horse also, but will the Academy really want to remember a man who won't be there to accept the award anyway? It doesn't help matters that his "The Pianist" has been greatly overlooked, either. The Lowdown: Nicholson, Cage and Lewis are shoe-ins in a category that will be hard to narrow down to only five selections, but I think the amazingly-talented Brody, who gave the best performance on film last year, has been acknowledged enough to make it into the final list too (note his recent SAG nod). For some baffling reason, alas, the voters will also want to nominate Richard Gere for his incredibly annoying work in "Chicago," even though the slot should be reserved for Robin Williams' performance in "One Hour Photo." If Gere manages to pull through, what's next? Eminem?! The Lowdown: As far as I'm concerned, only Kidman and Moore are really deserving of their expected nominations in this category. The other three, unfortunately, are anchored choices as well, which only undermines the purpose of the award. Hayek is okay in "Frida," although not award-worthy, while Lane and Zellweger are likable actresses who are trapped in thankless roles in overrated films. Possible upsets could come from Jennifer Aniston of "The Good Girl" and Meryl Streep of "The Hours," but neither have had any substantial exposure (although Streep will be recognized as a Supporting Actress for "Adaptation"). And if the Academy knows what's good for them, they'll forget all about Maggie Gyllenhaal in "Secretary" as well. The Lowdown: The catastrophe continues! Brilliant performances from Chris Cooper and Paul Newman will be accompanied by a couple of mediocre ones in this category, the most notable among them being Dennis Quaid's stiff turn as a closet homosexual in "Far From Heaven." Noah Taylor, meanwhile, stands little chance of recognition in "Max" because of the politics of his performance (would the Academy seriously run the risk of bad press by nominating a man who is playing Hitler? ), and Andy Serkis, who provided the lush foundation for Gollum in "The Two Towers," will be ignored because the Academy still isn't sure on how to acknowledge the digital approach. The Lowdown: It's a pretty broad race with this one, but in typical fashion, the voters will stick with obvious choices instead of opting to nominate obscure ones (most of which deserve recognition over the biggies). Bates, Streep and Collette are anchored, and Zeta-Jones and Clarkson, although not nearly as promoted as they should be, look to have near-locks on the last two slots as well. Possible sneakers could be Samantha Morton for "Minority Report" and Edie Falco for "Sunshine State," but they don't have the momentum behind them that they should. This category will probably prove to be the least surprising. Best Foreign Language Film: Lots of juicy material is available to the voters this year, and if they play their cards right, this could be the strongest year for the Foreign film. "Brotherhood of the Wolf," the best of them all, wasn't submitted for consideration, but "8 Women," the other film from France, should make a deserved appearance. Others will include "City of God," "Monsoon Wedding," "Talk to Her" and "Y Tu Mama Tambien." Best Makeup: An article from Reuters last Tuesday revealed that 5 of the 7 finalists for this category were disqualified for various reasons (the most pathetic, of which, was their excuse that "The Two Towers" didn't deserve a nomination for the same character makeup that won the award last year). The only two potential nominees that remain? "Frida" and "The Time Machine." One of three scenarios, then, is possible: 1) they nominate both contenders, 2) they simply give the award to one of the selections without a nomination process, or 3) they forget the award this year entirely. Considering that one of the finalists was a very unsuccessful feature from earlier last spring, the first choice doesn't seem like much of an option right now. Best Original Song: Traditional sappy tunes ranging from U2 and Paul Simon will dominate this ever-so-screwy category, but if the Academy really wants to up the ante, they'll nominate Madonna's "Die Another Day," the latest theme song from a Bond film, which revolutionizes the sound of the franchise in a brave and memorable way. Other possible dark horses are Eminem's "Lose Yourself" and Johnny Rzeznik's "I'm Still Here," both of which lost attention when the movies they were attached to floundered at the box office. Best Original Screenplay: "Far From Heaven," "Gangs of New York" and "Talk to Her" are all locks. The last two slots could be split by more obscure selections such as "Igby Goes Down" and "Signs," but my money's on '13 Conversations About One Thing" and "Antwone Fisher," instead, simply because of the undeniable strength they have received in being cited for writing. Best Adapted Screenplay: "Adaptation" will find its ultimate success as a nominee (and winner) in this category. Other nominations will include (inevitably) "The Two Towers" and "Chicago." What of the last two slots? "Confessions of a Dangerous Mind" is getting some attention, as are "The Hours" and "About Schmidt." But will voters really ignore the brilliant scripting of "Minority Report?" Only time will tell.